If you were to sit back and ask yourself what is the biggest problem in the world today, what would your answer be? The most obvious answers would be terrorism, rising corruption, a slowing world economy and so on. A less obvious problem, yet very serious, is excess debt. We have seen too much sovereign debt bring mighty nations down to their knees. Think Greece, Ireland, and Spain in Europe. We have seen 'too big to fail' corporates and financial institutions go to the government with a begging bowl. Bailing them out, though, has done nothing but bloat government debt to unsustainable levels. US and Japan find themselves in this quandary. What about India? The bigger problem here is corporate debt and bad loans. We all know what happened to Kingfisher Airlines. And its founder Vijay Mallya has been dominating news headlines of late for leaving the country...and leaving Indian banks in the lurch. Indeed, PSU banks in India have come under fire because of rising bad loans. Of course, Kingfisher Airlines is one extreme example. But that does not mean that the debt problem doesn't exist for India Inc. An article in Livemint talks about how some of India's most indebted business houses have not made much headway in bringing debt levels down in the last four years. Many of them have been looking to sell assets to repay debt. But the end result has been quite tepid. Fathom this: According to Mint Research, the ten debt-heavy corporate groups listed in Credit Suisse's report, House of Debt, have sold or announced the sale of assets adding up to Rs 1.33 trillion since 2012. This is only 20% of the Rs 6.52 trillion in total debt on the books of these groups as of March 2013. Clearly, it is a case of too many sellers in the market and not that many buyers. Meanwhile, the prolonged slowdown in the economy has only made matters worse. Commodity prices have crashed and infrastructure projects are yet to take off in a big way. All of this has raised the question of the debt servicing capacity of these companies as their performance remains sluggish. As a result, the banks that have lent heavily to them are suffering too as they have to deal with the menace of rising bad loans. We believe that it is always a dicey affair to invest in companies with too much debt on their books. Indeed, the problem becomes all the more pronounced when there is a slowdown in the business because interest costs will still need to be paid and this exerts considerable pressure on profits. In severe cases, there have been companies which have had to entirely restructure, sell off assets so that the cash can be used to pay off debt. This is exactly what is happening now. I believe that investing in indebted companies is a losing proposition in the long run. Indeed, when my team and I look to recommend stocks for the ValuePro service, we ensure that the companies that we select have healthy balance sheets with either little or no debt on their books. They may not always be high growth companies, but I think that's okay. In a trade-off between very high growth and low debt, I choose the latter. Do you think its fine to invest in companies with too much debt on their books? Let us know your comments or share your views in the Equitymaster Club. Since a bank is in the business of lending, more than the earnings, it is the capital strength that determines its future growth. 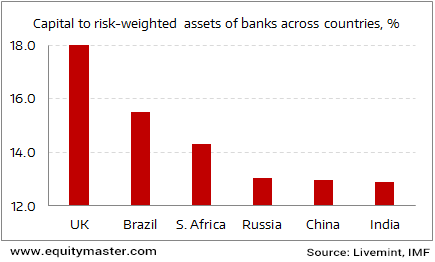 Capital adequacy ratio (CAR) for a bank is the proportion of capital held in relation to the risk-weighted assets that are essentially loans extended by it. The earnings of public sector banks (PSBs) have been hit hard due to piling of bad loans, higher provisioning coupled with sluggish credit offtake. Therefore, a large number of them are beginning to feel the strain on the capital front. Even the capital infusion of Rs 250 bn earmarked in the Union Budget 2016-17 remains grossly inadequate. As PSBs account for a lion's share of 70% of the total loans, the stress in their loan book has spilled on to the overall banking system. The capital adequacy ratio of Indian banks is not only very low as compared to UK but it ranks the lowest among BRIC countries. In other words, Indian banks need to be adequately fortified to service the pick-up in the economy in the future. RBI's move to accelerate the process of recognition and provision of bad loans at a time when levels of stressed assets are already high may seem ill-timed. However, the RBI governor's clean-up exercise has been lauded by none other than the International Monetary Fund. As per IMF's Managing Director, Christine Lagarde, RBI's effort to reinforce and strengthen the banking system is absolutely right since the system seems to be well capitalized. You can put lipstick on a pig, but it doesn't become a princess. So dressing up a loan and showing it as restructured, and not provisioning for it when it stops paying, is an issue. Anything which postpones a problem rather than recognising it is to be avoided. The Asset Quality Review of 50 banks in the country kicked off on 1st October 2015. As a result, a number of PSBs reported a huge jump in slippages and provisioning that severely constricted their earnings during the December 2015 quarter. Among large banks, Bank of Baroda has taken full hit and reported a loss in the December quarter itself, whereas other banks such as State Bank of India (SBI) and Punjab National Bank (PNB) would be recognising bad loans in the March 2016 quarter as well. RBI has provided some relief to banks by allowing property revaluation and foreign currency translation to be considered in the computation of CAR. Although the clean-up exercise has adversely impacted bank financials in the short run, it is likely to aid a faster recovery from the NPA crisis in the long run. While the Indian markets languished in the red for the most part of the trading session today, buying intensified in the later hours and pushed the indices into the positive. At the time of writing, BSE Sensex was trading higher by around 112 points. Buying was largely seen in FMCG, and IT stocks. The BSE Midcap and BSE Smallcap, however, were not spared and were trading marginally lower. This edition of The 5 Minute WrapUp is authored by Radhika Pandit (Research Analyst) and Madhu Gupta (Research Analyst). Have Cement Makers Cemented Their Profitability? Just how profitable have Indian cement companies been over the long term? Equitymaster requests your view! Post a comment on "The Biggest Problem Today for Corporate India...". Click here! 5 Responses to "The Biggest Problem Today for Corporate India..."
Negative balance or say debt in corporate is healthy sign of growth. If big shot never take risk than it is hard to believe than a country will grow. Now a million dollar question is " What propotion of debt to allow so that it does not become menace to bank or say a jolt in the country's economy as US undergone in 2008. Many big companies are running with more than 50 to 100 years successfully in India and they have kept thier commintment such as TATA , Banjaj , Reliance etc. Besides India loses heavily on external loans,based on the US Dollar and other Foreign Currencies,due to the ever-weakening of the Rupee,by the RBI.The World Bank Loan to India and the colossal loss it incurs,to our beloved nation, is a case in point. I am new to the stock world and plan to invest. To begin ,I started with subscribing to Equitymaster's 5 minute wrapups and other material. But lately, I see a lot of mails regarding small caps specially the Varthur Hobli mails. To be honest, this is very annoying. The deluge of the EM mails claiming to have found gems in the small cap segment seems like loud attempts to garner increased sales rather than keeping investor interest a priority. It is more like seeking promotion and support for EM team instead of bringing out any real value to the reader. Frankly, they are fit to be spammed. Instead of all the self praise and attempts to glorify team members' work which I feel is more of a stroke of luck(reading comments of existing subscribers), if the team can send out one free recommendation and analysis/report, once a month, it would do a world of good to people who really want to go for your services. And if you are so good at what you claim to be, given hundreds of companies to choose from, that should not be difficult for you. Frankly, your mails are like copies of myriads of mails sent by online fortune tellers who claim to know your past and read your future which they will share with you happily for a small sum. Debt is absolutely necessary for the present corporate to function, expand and diversify. But debt utilisation should be under constant watch of lenders to ensure its timely repayment with reasonable return on loans. At any point of time if lenders feel that company is indebted with excess amount than its capacity to service and there are indications for diversion of debt for irrelevant purpose, the lender should immediately raise the alarming signal and initiate remedial measures to protect its debt and also to maintain the solvency of debtors. In the present arena of global business with increasing cost of doing the business as well as to service equity better, debt is absolutely necessary but its limit should be fixed by the lenders by drawing accurate and perfect boundary lline. It is not the only corporate sectors are which made debt, the root cause is scam master doctorate ex-Pm of this unfortunate country lead the loot and debt companies. This he made in the name of opening economy to the industries and his political Hench men.The people whom he created are Ramalingaraju, Bujbal, A Raja, Marans, karuna, Maya, Lalu, Mulayam, virabhdra singh, Mally, Subratho roy, Chidu and his son, Many more chota politicians. Thai how he hold the Pm post for 10 years at the cost of poor people. Buy recommendation: This means that the investor could consider buying the concerned stock at current market price keeping in mind the tenure and objective of the recommendation service. Hold recommendation: This means that the investor could consider holding on to the shares of the company until further update and not buy more of the stock at current market price. Buy at lower price: This means that the investor should wait for some correction in the market price so that the stock can be bought at more attractive valuations keeping in mind the tenure and the objective of the service. Sell recommendation: This means that the investor could consider selling the stock at current market price keeping in mind the objective of the recommendation service.